Ask any archery fanatic and they’ll tell you the thrill associated with this game. Archery is a lot of fun, but if you don’t have the right equipment in your arsenal, it can actually be quite painful. One important thing to have is an arm guard. Fun as it may be, unfortunately with the wrong equipment you might just sustain a few bruises. What better way to avoid injuries than by getting the perfect arm guard? If you’re new to archery picking the right one might be a pretty daunting task. Luckily for you we put together a couple of recommendations for the best archery arm guards to make your search that much easier. Hopefully you’ll get one that not only fits well but comfortably too. We are here to take a look at some of the best archery arm guards out there at the moment. 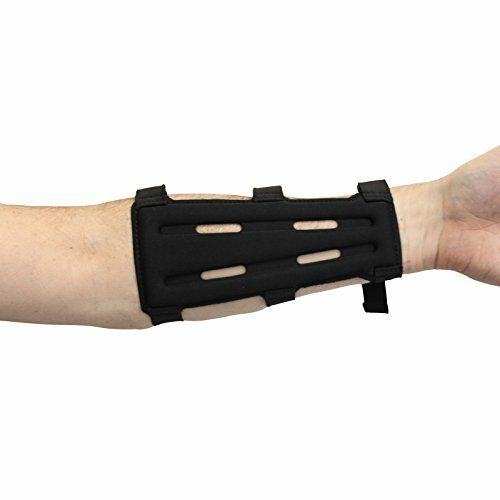 Here we have an armguard designed to fit any arm thanks to its three straps which are quickly and easily adjustable. Its middle width dimensions are 8” x 3“, which makes it wide enough to provide ample protection. This is a pretty basic yet effective arm guard to go with. Since it is 8 inches long, it ideal for most average sized men and women. It cannot be adjusted for size, so make sure that it fits well. With that being said, it does come with 3 straps so you can secure it in place and adjust it to fit the circumference of your arm. The SAS Armguard is made with foam, so it is nice and soft on your arm. It is fairly durable and should be able to handle a few months or even a year of shooting, depending on how much wear and tear you put it through. Beware that although it is quite durable, the foam used is not the best in the world, so repeated contact with fast-moving arrows and bow strings will not do it any favors. We like this option because it is vented so your arm won’t overheat. Though it’s a little stiff it fits well and won’t restrict your hand movement. But know this – though the material is light weight it’s quite thick and in no way compromises on quality and endurance – on the contrary it’s quite durable. Also, it won’t irritate your skin. 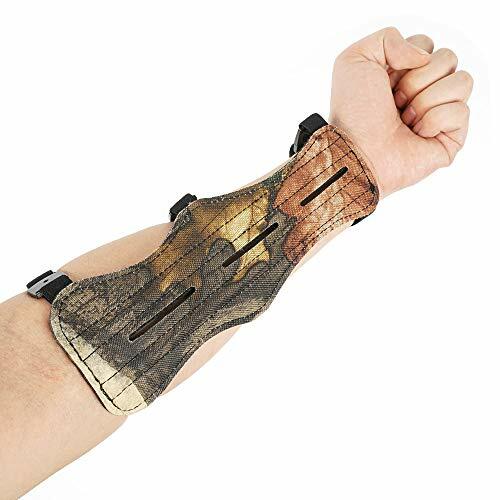 In most cases archery causes sweating and picking this arm guard will help reduce that. Here’s why: It’s vented to allow for adequate ventilation keeping your arm cool. However in extreme cases of intense sweating it might get a little uncomfortable. This is a good quality product which works as intended. It might not be suitable for beginners because it’s rather short. If you’re new to archery you’ll want to opt for a slightly longer one. 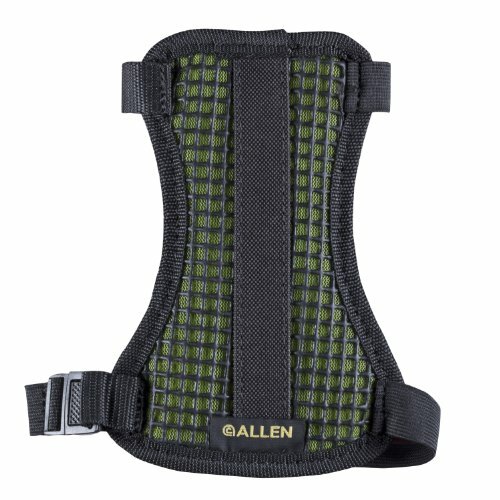 The Allen Company Archery Arm Guard is another good option to go with. This is a very durable one. It features a fairly hard mesh outer layer, a soft middle layer, and a soft layer which goes against the skin. The outer mesh is actually quite durable and should not rip or tear due to contact with bowstrings and/or arrows. It features an ergonomic design which ensures the arm guard mimics the shape of your arm. This shape also means it will be held in place during your shooting. Do keep in mind that the Allen Company Archery Arm Guard is specially designed for smaller archers and youths – not for adults. This arm guard features a rear and front strap with plastic buckle clasps, making it quite easy to adjust for width. It’s not hard to secure in place, but keep in mind that the straps and buckles are not the most durable out there. This guard features a heavy-duty strip down the middle for added arm protection. It fits comfortably without any pinching thanks to the elastic straps which are both soft and wide. You can easily adjust this arm guard with one hand without necessarily removing it; simply make use of the buckles which are super easy to fasten and unfasten. Though it fits well initially, it tends to loosen over time. As a result it needs constant adjustment which is rather inconvenient. Your arm will be protected from the bow because of the heavy strip which runs down the center. Apart from being a one size fits all, it comes in an attractive green color lined with black athletic mesh. Overall it’s a great pick for kids. Not only does it fit well but it won’t cause any string burn on your child’s arms. Unlike the other arm guards on this list, this is an archery glove. Now, the difference is that this covers the whole forearm instead of just the inside, plus it adds some protection for the palm of the hand. What is cool here, besides offering added protection, is that the ArcheryMax Archery Shooting Glove is a lace up glove, which means you can tighten it to fit you best, although doing up the laces is more than just a little difficult. The fabric is quite soft and feels comfortable against the skin. Even though the leather is pretty thin it’ll effectively keep your arm protected. It will take some practice, and maybe even a helping hand to really make this item fit correctly. However, in terms of forearm protection, the ArcheryMax Archery Shooting Glove is about as good as it gets. It is made out of genuine leather, with leather being one of the bets options for this kind of product. It’s very tough and will be able to protect your arm for thousands of shots to come. Also, it comes in right- and left-handed models. It’s handmade and features a glove design which fits medium- to large-sized hands. The arm guard is flexible enough not to hinder mobility during your game. Though the length is fixed the width is adjustable to your desired preference and comfort. One of its drawbacks is there’s no way of tightening it when it gets loose. You might have to purchase an additional item to secure it properly. Another downside is after a while it can get pretty hot. The KRATARC Archery Leather Wristband is very lightweight, so much so that you will barely be able to feel it. It is made out of real leather, which is great because it is about as durable as an arm guard can be. You won’t feel the arrow or bow string on your arm when wearing the KRATARC Archery Leather Wristband. The inside is also quite soft, a big bonus, although not very breathable. 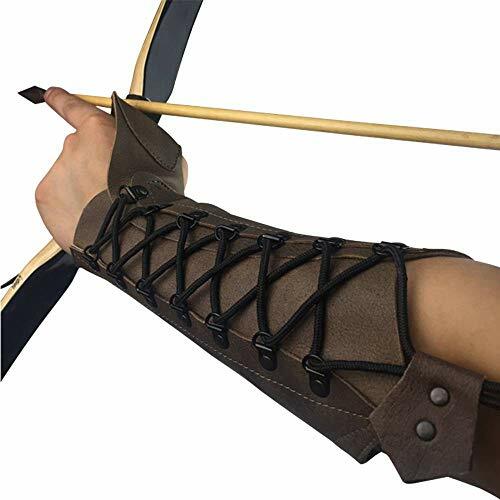 What is cool about this specific archery arm guard is that it is unisex, one size fits all, and ambidextrous too. It comes with a full-length lacing system, one which looks kind of cool, plus allows you to adjust it for a tight, comfortable, and secure fit. With that being said, it will be a little difficult to do up the laces as you will only be able to use one hand to do so. This brand is known for its high-quality products and this arm guard is no exception. It’s made of supreme leather which features metal studs. The material it’s made of makes it both scratch resistant and durable. It’s designed in a way to fit different arm sizes thanks to the side laces which are easily adjustable. It’s pretty lightweight for your added comfort. Plus it provides your lower arm with the best possible protection. This arm guard is 8.7” long and is ideal for both right- and left-hand users. Apart from archery you can use it for hunting and shooting. It has adjustable eyelets to keep it in place. However, putting it on and removing it is a bit of a hassle. Also note that it runs large in size so you might want to get one size down from your normal selection. You can consider replacing the elastic band with a thicker one if you need it to last longer. 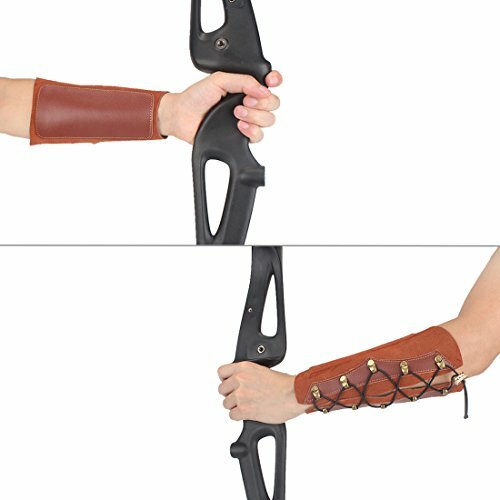 This is an 8.5 inch long armguard for archery, so beware that it is not designed for youths or people with short arms. With that being said, it does come with 3 adjustable buckle straps so you can keep it securely in place, exactly where it is supposed to be. With that being said, the buckles are plastic and not all that durable, plus the straps might rub you the wrong way a little bit. On the other hand, the most important part here is that the Chuangtong Arm Guard does do a great job at protecting the forearm from arrows and bow strings. It is made with durable nylon, which might not be better than leather, but a close second. It can definitely take quite a bit of punishment. The Chuangtong Arm Guard is also vented to help keep your arm cool. This arm guard is long and will cover most of your forearm protecting it from the arrow. It will be held securely in place thanks to its elastic straps. All you need to do is simply adjust them to your desired size and it’ll fit perfectly. You can expect a non-sticky feeling throughout your game because of the air vents designed to allow adequate airflow. Also it feels quite comfortable when wearing it. It features a quick buckle functionality that allows you to secure it easily and quickly. This arm guard is made of nylon fabrics making it pretty durable. It’s designed to cover the forearms and biceps although some customers feel it’s smaller than expected. Overall it functions well. The reviews are in so which one will you pick? In our opinion the Kratarc archery arm guard is the preferred brand. Not only is it lightweight but it’s also flexible. You can easily adjust it to suit your desired level of comfort. Sure, the sizes run big but when you get the right size it works pretty well. Now that you have all the information why not choose one and take your archery skills to the next level?